We’d love your help. Let us know what’s wrong with this preview of Nanaville by Anna Quindlen. Mother, mother-in-law, grandmother--the Pulitzer-winning columnist and #1 bestselling author reflects on the roles we play throughout our lives, sharing personal stories and advice on the special joys and complexities of middle age. It's a little challenging to suss out why exactly it can be so magical. . . . All I know is: The hand. The little hand that takes yours, small Mother, mother-in-law, grandmother--the Pulitzer-winning columnist and #1 bestselling author reflects on the roles we play throughout our lives, sharing personal stories and advice on the special joys and complexities of middle age. It's a little challenging to suss out why exactly it can be so magical. . . . All I know is: The hand. The little hand that takes yours, small and soft as feathers. I'm happy our grandson does not yet have sophisticated language or a working knowledge of personal finance, because if he took my hand and said, "Nana, can you sign your 401(k) over to me," I can imagine myself thinking, well, I don't really need a retirement fund, do I? And besides, look at those eyelashes. Or the greeting. Sometimes Arthur sees me and yells "Nana!" in the way some people might say "ice cream!" and others say "shoe sale!" No one else has sounded that happy to see me in many many years. To ask other readers questions about Nanaville, please sign up. Anna Quindlen is one of those writers that makes a reader happy that she is so prolific. As with Dani Shapiro, she is as proficient in memoir as she is in fiction, and this lovely sharing memoir of grandmother-hood is a good example. Having been a prize-winning journalist, she writes in a style I appreciate, in dispensing information in fine language without padding. Here she discusses the role of the grandmother, how the hardest part of the role is stepping aside as an auxiliary, not performing Anna Quindlen is one of those writers that makes a reader happy that she is so prolific. As with Dani Shapiro, she is as proficient in memoir as she is in fiction, and this lovely sharing memoir of grandmother-hood is a good example. Having been a prize-winning journalist, she writes in a style I appreciate, in dispensing information in fine language without padding. Here she discusses the role of the grandmother, how the hardest part of the role is stepping aside as an auxiliary, not performing the major role or make the big decisions. She examines, also, parts played by the mother, daughter, mother in law, and daughter in law, all of which she has been, leading to the differences in how the landscape of the concept of family has changed over the years even in her lifetime. Nowadays, the gradual morphing of the cookie jar gramma for instance into a get-down-on-the-floor-and-play glamma. Recommends it for: grandmothers, and those anticipating. Ah geez. I always love her work, but this might be the one I love most. Full review by pub date. Anna Quindlen became a grandmother when her oldest son and his Chinese wife had their first child, Arthur. Quindlen, who soon became know an Nana describes life in Nanaville, a place where she learns to be a grandmother. She takes us from the experience of seeing Arthur for the first time to the point where she learns that her son and daughter in law are expecting a second child, a girl. This book could serve as a guide for first time grandparents as it contains advice on what to do and what not Anna Quindlen became a grandmother when her oldest son and his Chinese wife had their first child, Arthur. 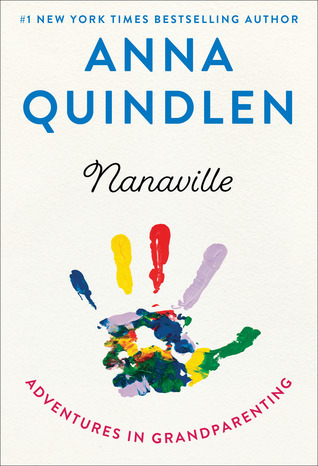 Quindlen, who soon became know an Nana describes life in Nanaville, a place where she learns to be a grandmother. She takes us from the experience of seeing Arthur for the first time to the point where she learns that her son and daughter in law are expecting a second child, a girl. This book could serve as a guide for first time grandparents as it contains advice on what to do and what not to do with the grandchild and their parents. I have been a fan of Quindlen since she and I were both young mothers trying to cope with the joys and tribulations of raising children in the 70s. I read her autobiographical books as well as her novels and feel as if she is a good friend. This book is another winner. Wept through most of this one ... and loved it, of course. Quindlen understands the finer points of grandparenting ... a balancing act, but so worthwhile! It’s a mantra Anna Quindlen advocates in “Nanaville: Adventures in Grandparenting,” an accessible, sweet read chock full of wisdom about Quindlen’s toe-dip into the blessed waters of grandparenthood. “There are really only two commandments of Nanaville: love the grandchildren and hold your tongue,” she writes. This slim book is rife with memorable quotes and endearing times, “Small Moments,” Quindlen has relished with her grandson Arthur, her oldest son’s boy, followed by light-hearted lessons she’s garnered from these experiences. Quindlen’s writing is descriptive and relatable and calls to mind cradling an infant, its downy head in the crook of your arm, the heaven-sent fragrance of babydom radiating from your precious bundle. There is a healthy dose of humor in Quindlen’s book too, the angst of complicated, confounded car-seats, the sacrifices she’ll make for Arthur when he gets older—ride a Tilt-A-Whirl—and communication issues that arise because Arthur is half Chinese and sometimes spouts Mandarin along with English. Quindlen doesn’t focus solely on being a grandparent but also reflects on being the mother of three children, all adults, comparing how her role as mother and grandmother are both different and alike. “Nanaville” is a treasure to keep or gift to another in the grandmother set, a book to refer to when you’re tempted to believe “Mother knows best.” Using Quindlen as a guide, grandparents can’t go wrong. I have long been a fan of Anna Quindlen's and was thrilled to win an ARC edition of this book in a goodreads giveaway. Even though I never had children of my own and my step-grandchildren all have other grandparents, I still immensely enjoyed every chapter in this keenly observed and wittily written book; definitely a book you want to share with all your grandparent friends. 5 stars....and not just because I am Nana. She totally gets it, including the contrast between her upbringing and her children's to today's parenting and grandparenting, terms that didn't exist until recently. Loved this gem! This is a beautiful book. Anna Quindlen has captured the essence of being a Nana in short little snippets. I’m a fellow Nana, and I highly recommend this book! A fun book especially for grandmothers, though not as good as other books by Anna Quindlen. Worth reading, though. 'The best'-what grandparents whisper to each other over the baby's head. A passionate paean to grandparenting filled with wise words and garnished with delightful anecdotes. I won this book in the giveaway! I absolutely adored Anna Quindlen's stories of being a grandmother. Quindlen charmed me throughout the book and left me with many smiles. Anna Quindlen is proud to be a nana. This is a charming love letter to being a grandparent and a memoir of her early experience. Arthur, her grandchild, has another set of grandparents who speak Mandarin. AQ and her husband took Mandarin lessons until their treasured tutor moved away. I admire their diligence in taking on this extra task. This is a gem of book. Thank you to the publisher and netgalley for an advance copy.